If you haven’t registered yet, better do it right now. If you haven’t registered and you haven’t specified a domain, 3D-reviews will display a message on your website asking you to confirm your domain. Add your domain on the My Account → My Domains page. As soon as a 3D-review is opened on any page of a newly added domain, the domain is confirmed and added to 3D-reviews’ usage statistics. 3D-reviews can be integrated with an iframe embedding code. Just find the product you want in the Catalogue and copy the code. To change the dimensions of the 3D-review area, modify width and height parameters in the embedding code. We recommend a frame size of 700px x 500px. The most convenient way to display 3D-reviews is in lightboxes over the product page. Place a launch button for 3D-review lightbox in a prominent position with product information near other media content. The screenshots below are taken from a 3D-review on our product demo page. When the button is pressed, a lightbox containing the embedded iframe code plays the chosen 3D-review over the dimmed content of the product page. We’ve created 22 ready-to-use versions of the "Launch 3D-review" button. Choose one you like and install it on your website. You can also embed 3D-reviews into the body of the product page itself – as we do in our Review3 Catalogue. Please note that in this case we recommend setting "After click on preview" start mode in the My Account → Style section. 3D-reviews work on all modern smartphones and tablets with Android and iOS. 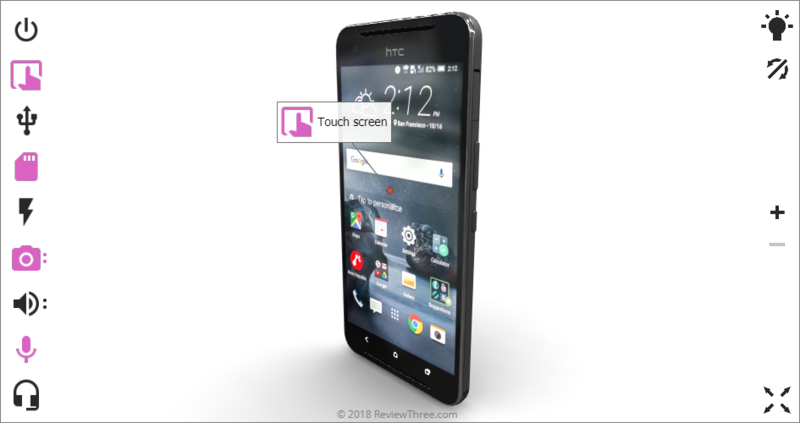 3D-reviews are fully optimized for mobile usage and gesture control. 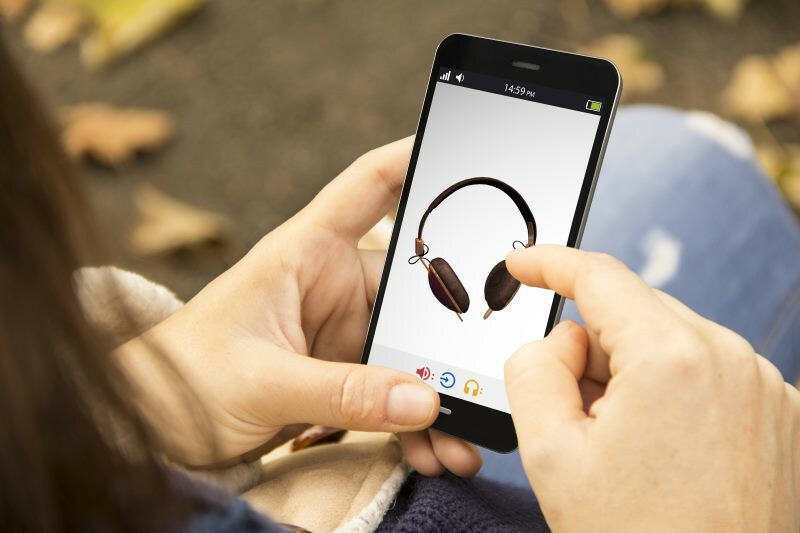 By the way, your customers will get a better 3D-review experience on a mobile than on a PC. This is because rotating the product with your hands and fingers feels much more natural; it’s closer to the way you’d really look at the product. For mobile devices, we recommend you use a simplified full-screen 3D-review page than a lightbox. You’ll see that the source code for this page is very simple – the body tag contains only one iframe tag, which embeds the requested 3D-review (REVIEW3_ID is received from the URL parameter). You can use the same page on mobile devices instead of a lightbox. If you copy our “review3_simple.html” page to your webserver, you’ll see that the 3D-review “REVIEW3_ID=8407” (with the URL https://mywebstore.com/review3_simple.html?8407) opens automatically on page load. If your webstore has a special mobile version (e.g. https://m.mywebstore.com), then tapping the 3D-review start button will automatically open the simplified full-screen 3D-review page. If your webstore has adaptive design, then after tapping on the 3D-review start button, your code needs to check the screen dimensions available on the browser. If they‘re smaller than those on the PC version, the simplified full-screen 3D-review page should be opened instead of the PC-version lightbox. Some lightboxes support adaptive presentation of content on mobile devices, but they may be targeted at presenting images and videos only. If you want to present 3D-reviews in lightboxes on mobile devices, please check lightbox functionality to ensure that 3D-reviews are displayed correctly in both landscape and portrait orientations on different sized devices. It’s important that your customers feel comfortable working with the content of your webstore. For the moment, it is not possible to embed 3D-reviews directly into your mobile app. There is, however, a way around this restriction. You need to call the URL of the simplified full-screen 3D-review page (see chapter 5) from your mobile app. This will cause the mobile browser to appear on the user's device. When the user has finished looking at the 3D-review, they press the 'Back' system button to close the browser and return to your mobile app, which will look exactly as it did when they left it. We may need to make some adjustments to ensure that 3D-reviews works correctly when called from your mobile app. If you have any issues when using this workaround solution, please inform our support team at support@reviewthree.com, and they will be happy to help you. Settings in the My Account → Style section allow you to manage the appearance and behavior of your 3D-reviews so that they fit perfectly with the overall look and feel of your webstore. 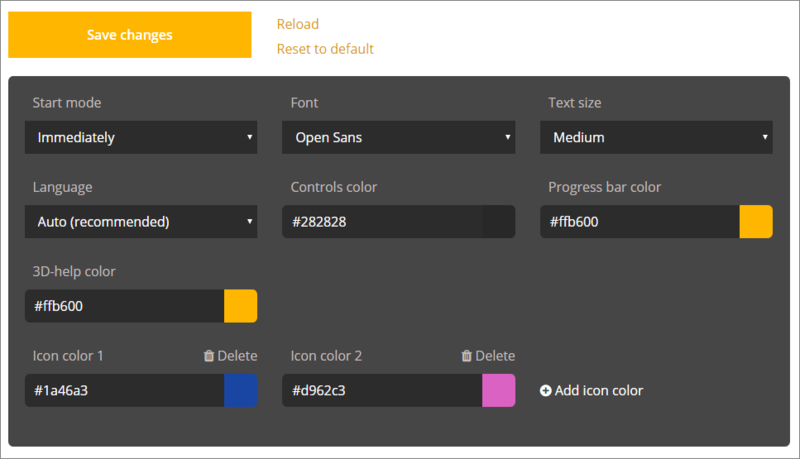 You can set up color schemes, font style and size, and 3D-review start mode. If you embed 3D-reviews in the body of the page itself, we recommend you change start mode to "After click on preview"
The file contains three sheets: Review3_List, MPN и GTIN. The first sheet contains a full list of the 3D-reviews currently available. The MPN sheet contains the Manufacturer Part Numbers (MPN's) that map precisely to the matching 3D-reviews. The GTIN sheet contains the information that maps the barcodes to the matching 3D-reviews. We support 8-digit UPC-E (GTIN-8), 12-digit UPC-A (GTIN-12), 13-digit EAN (GTIN-13) and 14-digit GTIN-14. Please note that GTIN data differs from region to region and may not give complete and accurate results. Every Monday, via email, we send our registered users the Excel spreadsheet containing all the data for the reviews released in the previous week. 9. How to know which 3D-reviews are installed on your website? You can also filter the search results by 3D-review release date. This is convenient if you haven’t visited the catalogue for some time and you want to find out which 3D-reviews have been released since then. In the Catalogue, the small text box above the image of each product contains the year and month that the product went on sale in at least one country. You can use this date for filtering too. We can save you a lot of valuable time by mapping 3D-reviews to your products. On a regular basis, we will carry out the mapping and create the links between your products' SKU and our unique 3D-review ID (REVIEW3_ID). 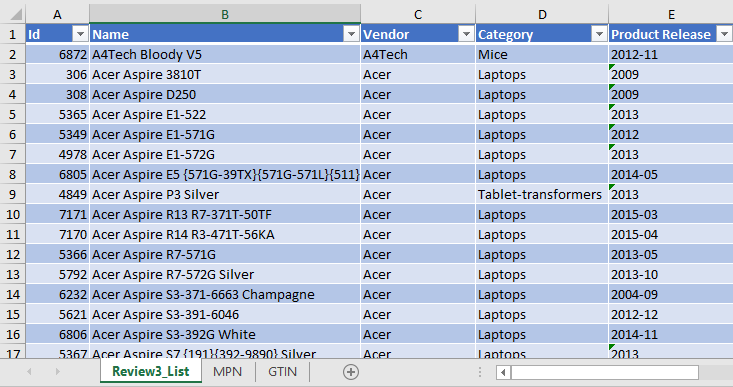 Find your SKU in the table, and you will see which 3D-review should be displayed on the product page. Some 3D-reviews may appear on more than one of your product pages if the particular product has versions with different internal parts (e.g. RAM size). However, no page will contain more than one 3D-review. We start with a basic review of your webstore and the initial mapping of your products to our 3D-reviews. From then on, we will regularly add new mappings as new 3D-reviews are released. In order to do this correctly, we need to know where on your website we can find the SKU (the SKU is usually contained in the URL or can be found on the product page). You can get the mapping through our XML web service. We will assign you a customer ID – mywebstore, for example. The array of results, Products, contains no elements or one element, Product, whose child element, Id, is an identifier of the 3D-review. If search results are not empty, the page initialization code creates a "Show 3D-review" button on the page. This button launches the lightbox containing the 3D-review. The code also creates an iframe with an src value like this: "//reviewthree.com/embed/REVIEW3_ID". We recommend that you cache received mappings on your server. This allows your webstore to display the "Show 3D-review" button immediately on page load without having to wait for a response from our web service. You will need to check the REVIEW3_ID on page product load. If the value is not empty, and the last check, REVIEW3_LastCheck, was carried out less than 24 hours ago, then it should display the "Show 3D-review" button, which will launch the 3D-review with the matching REVIEW3_ID. If the previous REVIEW3_LastCheck was more than 24 hours ago, you should ask our XML-web service about the 3D-review for the product, sending them your product SKU, and save the REVIEW3_ID you receive for further usage. Finally, you will need to update REVIEW3_LastCheck with the current time. In some special instances, you may want to search for 3D-reviews using our API. To do so, you’ll need to make a request to our XML-web service, as described in section 10 above. 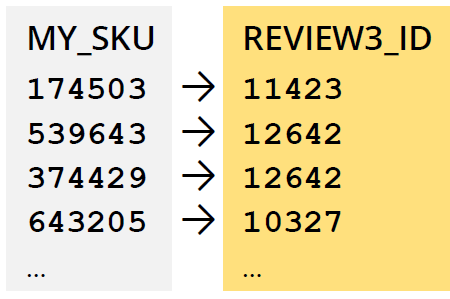 In the code on our demo product page you will find a working example of using API to search 3D-reviews by product barcode (EAN). In the example, the immediate usage of the results is presented. We recommend that you cache the search results as described in section 10. Our customer support team is here Monday – Friday, 9am – 5:30pm CET. It's currently Tuesday, 07:35 CET.